1 Samuel 17:1-11 (IEB): “The Philistines gathered their armies for a battle (this happened about 27 years after their defeat at Michmash) (1 Samuel 13-14). They met at Socoh (about 15 miles west of Bethlehem) in the territory of Judah. Their camp was at Ephes-Dammim (about 4 miles northeast of Socoh) between Socoh and Azekah. Saul and the Israelites gathered in the Valley of Elah (between Socoh and Azekah, along the Es-Sunt Wadi) and they camped there. They drew up their battle-lines to fight the Philistines. Now the Philistines stood on one hill. The Israelites stood on the other hill. The valley was between the two armies. There was a champion (literally, “the man of the interspaces – the between”, that is, the man who fought between the battle-lines; what we call “no man’s land”.) named Goliath who appeared between them. He came out of the Philistine camp. He was from Gath. And he was 9 feet 6 inches tall. He had a brass helmet on his head. And, he wore a coat of scale-armor. It was also made of bronze, and it weighed 125 pounds. He wore brass shin-guards on his legs. And, he had a small bronze javelin across his shoulders. The shaft of his big spear was made of wood. It was like a weaver’s pole. The iron point of it weighed 17 pounds. A man who carried his shield walked ahead of him. As I leave my study today I can relate! We are all faced with our own “Giants” whether it is a health issue, financial struggles, or difficulties in relationships. The world would strip me of confidence, but God’s word ALWAYS encourages me. I may not have the strength on my own, but with God’s help I can do anything He wants me to do. My prayer today is that I will place my confidence in God, and not allow the problems of this world to overwhelm me. David hears the taunts of Goliath. 1 Samuel 17:14-27 (IEB): “David was the youngest son of all of Jesse’s sons. (Only the three oldest sons were in Saul’s army.) But David used to go back and forth from King Saul to Bethlehem. There David took care of his father’s flock. The Philistine, Goliath, came forward every morning and evening. He presented himself to the Israelite army over and over. This pattern continued for 40 days. So early in the morning, David left the flock with another shepherd. And David took the food and left, just as Jesse had told him. When David arrived at the barricade, the army was leaving. They were going out to their battle positions. The soldiers were shouting their war-cry. The Israelites and the Philistines were lining up their men to face each other in battle. So, David left the food with the man who kept the supplies. Then he ran to the battle-line. He asked his brothers if they were O.K. But, while David was talking to them, look, Goliath, the Philistine champion from Gath, stepped out of the Philistine lines. He shouted things against Israel, as he usually did. However, this time, David heard it. As I leave my study today I can’t help noticing the difference in David’s reaction to Goliath’s challenge to that of Saul’s army. For 40 days Saul’s army have been listening to the taunts and insults of Goliath, and they are afraid and intimidated. They have not had the courage to do anything about it in spite of the reward that Saul offers. Saul may be the king but he does not have the power of the real King, the Lord God Almighty, behind him. His army knows they can’t win. David loves God and God is with him. David is not afraid; he is outraged that Goliath would dare to speak so disrespectfully (and intends to do something about it!) He is confident because God is with him. It’s a lesson I need to remember. David steps up to the challenge. David has heard Goliath’s insults to the people of Israel and its army. Saul’s soldiers have told David of Saul’s incentive to any who will step up and fight Goliath. As I leave my study, there are three things I’m thinking about: the reaction of David’s oldest brother to David’s presence at the battle-line, the lack of response from Saul’s army to Goliath’s taunts, and David’s refusal to use Saul’s armor. Eliab was angry at David for being at the battle-line where he didn’t belong and thought him arrogant for questioning the soldiers. This was his little brother who couldn’t possibly be there to fight! I’m sure that Eliab was also a little embarrassed that he and the rest of the army had been there for 40 days hearing Goliaths taunts and had not had the courage to do anything about it. David was wise to discard all of Saul’s armor. It was a statement of his trust that God would protect him and that God would provide the victory. It’s a reminder to me that as long as I am doing God’s will, He will be with me. I don’t need to be afraid or feel intimidated. 1 Samuel 17:40-43 (IEB): “David took his own rod in his hand. 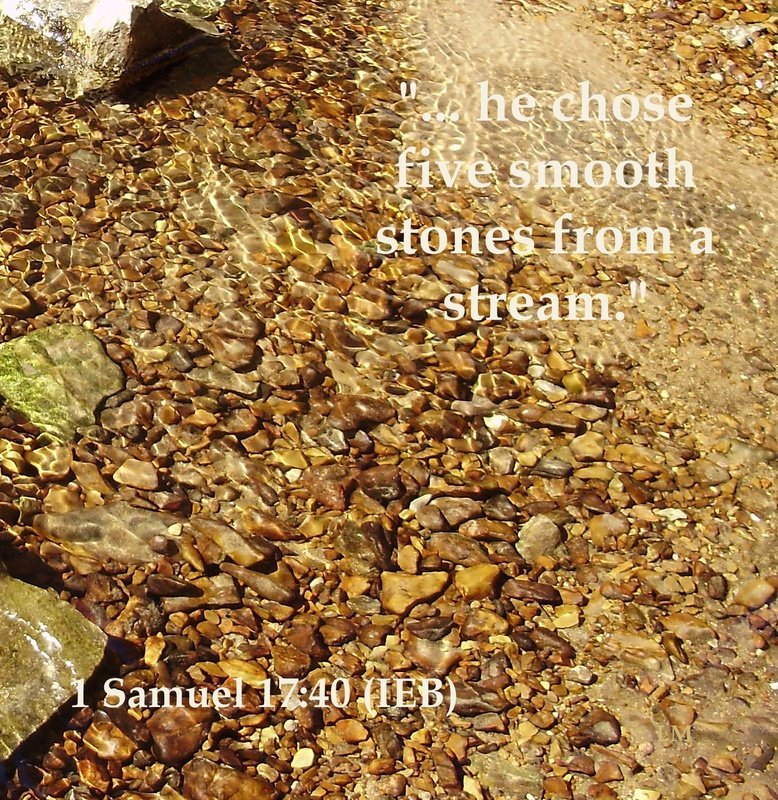 And he chose five smooth stones from a stream. He put them in his special shepherd’s bag, and his sling was in his hand. Then he went closer to meet the Philistine champion. Following the footnotes: (b) Goliath thought that David was not worthy of a champion’s efforts, skills, and experience. In other words, Goliath did not want to sink below his dignity as a professional soldier. Concerning “dog”, see 1 Samuel 24:14; 2 Samuel 3:8; 9-8; 16:9. The word “dog” in the Middle East meant “insignificant”. Note: In the Middle East, dogs around villages were wild. They were not pets. People held much contempt for dogs. As Goliath moved closer to attack him, David ran quickly to meet him. Then David reached into his bag and took a stone from it. He put it into his sling, and then David slung it fast. The stone hit the Philistine in his forehead and it stuck there. And Goliath fell face-down on the ground. As I leave my study today I am encouraged by David’s example. He would not allow Goliath to intimidate him, even though he was much bigger and more experienced. He would not just stand by and listen to his Lord be taunted. And he had faith that the Lord would be with him. But more important, I am reminded that David gave the credit to God. He was a hero but he humbled himself by proclaiming that the victory belongs to the Lord. Every day, I hear and see disrespect for God’s word. My prayer today is that I will have the courage to stand up and say “that is not right!” and the humility to give God the glory when he has enabled me to succeed. Obedience brings David success and loyalty. 1 Samuel 18:1-16 (IEB): “When David finished talking with Saul, Jonathan (Saul’s son) admired David very much. In fact, he loved David as much as he loved his own life. From that day onward, Saul kept David with him. He did not permit David to go back home to his father’s house. Eventually, Jonathan made a pact with David. He did this because he loved David as much as he loved himself. Jonathan took off his robe and gave it to David. Jonathan also gave him his tunic, as well as his sword, his bow, and his belt. David went out to fight wherever Saul sent him. And David was very successful. Then Saul promoted David, putting him over some of his soldiers. Saul’s officers and all the army were very glad to see this. This song of the women made Saul very upset. He thought it was a bad thing. He said, ‘They claim that David has killed tens of thousands, but they say I have killed only thousands! What else will belong to David? The Kingdom? !’ So Saul watched David very closely from that time forward (Saul was jealous of David). On the next day, that same deep depression (See 1 Samuel 16:14-16) took hold of Saul. Inside his house, he babbled like a crazy man. With his hand, David was playing the harp as he always did when Saul was depressed. But Saul had a spear in his hand. He raised the spear toward David, thinking to himself: ‘I will pin David to the wall!’ But David dodged him twice. As I leave my study today, I am reminded again that God was with David because he served Him, and was obedient to his will. David was rewarded with success and loyalty. God was also with Saul in the beginning, but when Saul became self-serving God abandoned him. Saul is now full of insecurity, and jealousy, and is slowly going mad. I pray today for an open heart to hear and understand God’s will. I pray that God will keep me from temptation, and rescue me when the world tries to take my focus away from Him. Saul had promised his daughter in marriage to the one who killed Goliath. But Saul is increasingly alarmed at David’s popularity with the Israelites. He hopes that David will be killed by the Philistines. Saul offered his older daughter to be David’s wife but David says he is not worthy enough for this honor. When it came time for them to marry, Saul gave her instead to Adriel of Meholah to be his wife. Saul’s other daughter Michal, loved David. Saul thought to himself “I will let Michal marry David. Then I will use her as a trap for him. And the Philistines will defeat him.” Saul had his servants tell David that he wanted David to marry Michal. Following the footnotes: (a) implying that David could not afford a large marriage present for Princess Michal. See Genesis 34:12-13; Exodus 22:16-17; Deut. 22:28-29. Exodus 22:16-17 (IEB): “If a man seduces a virgin girl who is not engaged and goes to bed with her, then he must certainly pay a dowry (a) for her to be his wife. However, if her father absolutely refuses to give her to him, then the man must pay the usual bride price for virgins.” Following the footnote (a) a gift to the bride’s family by the prospective husband in payment for the bride. This custom is still practiced today in some parts of the Middle East. Following the footnotes: (b) Philistines were uncircumcised pagans. Most other ethnic groups near Israel practiced circumcision. The Philistines were some of the best warriors. Saul wanted to make sure that David did not kill inferior soldiers and then pass them off as Philistines. As I leave my study today it is clear that willfulness, lust, and deceit have always been with us, it is part of our sinful nature. It is only through Christ that sin looses its power. Saul sent David on a mission which Saul thought impossible, hoping that David would be killed. But God was with David, and David brought back twice what Saul had demanded as a bride price for his daughter Michal. So Saul gave David his daughter Michal to be his wife. 1 Samuel 18:28-30 (IEB): “Saul realized that Yahweh was with David. He also saw that his daughter Michal was in love with David. This caused Saul to be even more afraid of David. And, Saul hated David for the rest of his life. Jonathan persuaded Saul not to kill David. Then Saul swore this oath: ‘As surely as the Always-Present One lives, David will not be put to death!’ After Saul left, Jonathan called out to David. Then he told David everything that he and his father had talked about. Later, Jonathan brought David to Saul. So, David was in Saul’s presence as before. War broke out again. So David went out to fight the Philistines. He defeated them badly, and they ran away from David. Way before David entered Saul’s life, God had rejected Saul because he had turned completely away from serving God (1 Samuel 15). Saul turned his focus on himself and the result was insecurity, depression, jealousy, fear, and hatred. My prayer today is one of gratitude for the examples of Saul, Jonathan, and David. Saul shows what happens to those who are self-serving. Jonathan shows how to act honorably in a difficult situation, and David’s example shows the reward for being obedient to God.